Great day out. Well looked after by the crew. Lots to do and see. Very happy. Excellent value for money. Loved it. The first swim stop in the tour was amazing. The cruise captain was cheerful and helpful. The staff were great. This tour is a long day. Leaving Marmaris at 9.30 and arriving back at sunset approx 8pm. Starting with a slow trip along the coastline of Marmaris before sailing along more coastline of Turkey. There is a hard sell for drinks and food even tho lunch is included. Most of the staff are quietly helpful. One character tho entertaining at first, becomes a bit tedious. Loud music and constant barrage of let me get you a cold drink spoilt the day. Be prepared for spending a lot of time in the sun! During July / August that can be temperatures of 40C plus! We did not get spend time on isolated/private beach, it was a dip in the sea stay close to the boat type of swim. There was a more leisurely break on Turtle beach near Dalyan, which was for an hour. The cruise along the Dalyan River is uneventful apart from seeing the Kings Toombs there is little to see. The River cruise final destination is the Mud Bath/ Thermal Spa Pool. All a bit rushed. With a lot of people and the mud bath itself being very slippery, there was not enough time to enjoy a good covering of mud and thorough showering off. time did not allow with high numbers of visitors. Belongings are left on the table - everyone is at the risk, tho there is CCTV. An experience, but not one we will repeat. Excellent Day Out. Great ship, friendly staff, and plenty of space. Food was good also. My only reason for not giving this 5 stars was the fact that the staff search bags on the way onto the ship to check you don't have any drinks or food with you, they even confiscate water from you. They appear too desperate to make more money from you on food and drinks which aren't cheap especially when you are out from 8am to 7pm in the evening. Apart from that was a great day out, with amazing scenery, fun mud maths and was very well organised. Also lovely the belly dancing guy on the way home. Was a very enjoyable day - exactly as described and both my husband and I had a lovely day. Caution - take throwaway flips flops to walk around the mud baths - very stoney and quite a walk between the mud bath and the showers and back again to the thermal pool. The highlight was one the campest, funniest waiters/hosts Club Captain Amman - he made the trip even more memorable - his table top belly dancing was hilarious. This tour was great lots of variety very well organised and heaps of fun, especially the mud bath experience. Very good value for money. 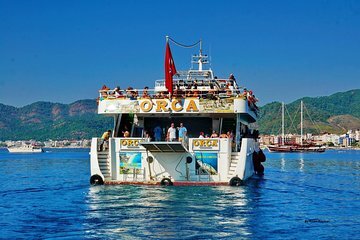 If you fancy a bargain trip with the locals on a very clean boat then this is for you - we loved it - organised chaos with good facilities and fun great value ! !